Am I Blue - or is it the color? Am I Blue?... or is it the color? DVAA is proud to host Am I Blue?... or is it the color?, a solo exhibition in Gallery 2 (second floor) of artwork by DVAA artist member Edna Santiago. This exhibition runs concurrently with the DVAA hosted exhibition in Gallery 1, Solid Universe Theory, with paintings by artist member Martha Hope Carey. In the words of Edna Santiago: “Blue, Azul, Cerulean, Azure. This color communicates honesty and loyalty, power and authority, stability and strength, patriotism and liberalism. Denotes masculinity and professionalism… refreshing, calm, blue skies and water, spirituality with Krishna, or the Virgin Mary. Alternatively, blue also represents sad emotions like depression. Many a song has cried out its feelings of disappointment, or ‘feeling blue.’ When your life line of oxygen is cut, you turn blue… Interesting that something can represent such extremes as wealth or emptiness. I choose the blue of the sky and the blue ocean." 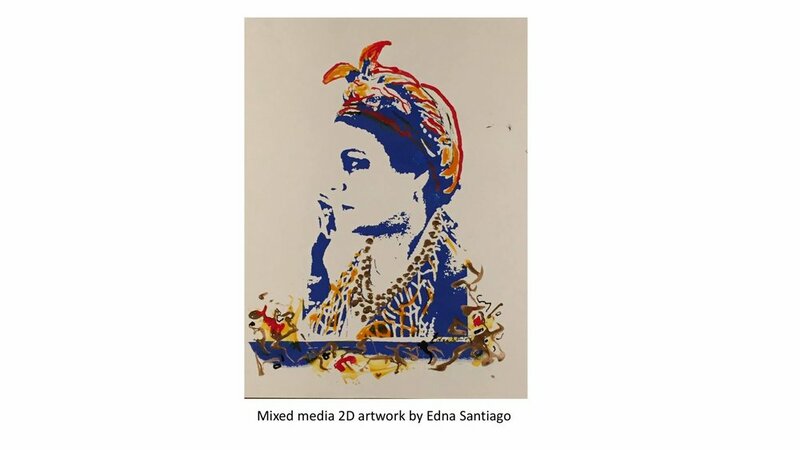 Edna Santiago is a Certified Finecraft Artisan, Printmaker, and Plastic Artist of Puerto Rico. Awards and recognition at fine arts shows include: PSC, Beauty, Art & Gift Gallery, and the front page of "Philadelphia Stories" Spring 2009 publication. Edna is a member of ARTsisters, Philadelphia FineCraft Guild, Philadelphia Sketch Club, Mainline Art Center, and Da Vinci Art Alliance. She was curated into the Delaware County Studio Tour in 2016 and 2018, as well as the Mainline Art Center, HGC, and Narberth Spring Craft Fair. Edna is largely a self taught artist (who started due to personal loss in 2006), and has participated in local art schools such as: Mainline Art center, PAFA, Fleisher Art Memorial and Wayne Art Center. DVAA thanks our 2018 exhibition sponsors DeFino Law Associates and Seed&Space!